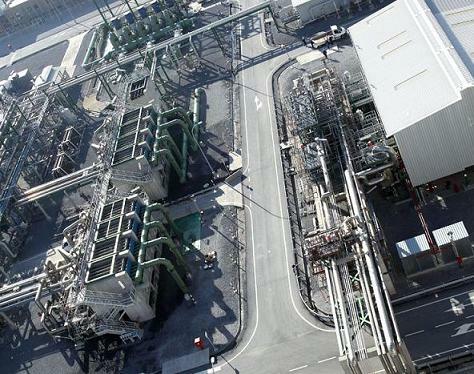 The Bahía de Bizkaia Gas regasification plant occupies nearly 150,000m2 in Zierbena, Bizkaia Province, in the industrial area of the Port of Bilbao. During construction of our regasification plant, the latest technologies were used so as to comply with all EU environmental regulations. 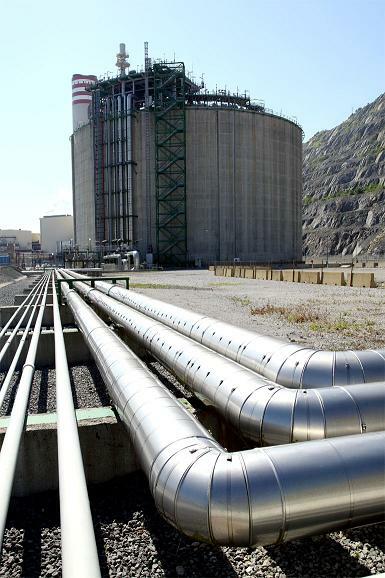 The enlargement of the third storage tank further strengthens BBG’s position in the gas system, and the plant is currently the second most used nationwide. It is part of a strategic project, as it enhances the plant’s unloading capacity to serve big LNG carriers of up to 270,000m3 and its storage capacity to meet peak demand. All this vailable capacity enables BBG to perform the, the entire regasification process.. The graphic shows the main steps and equipment of the BBG regasification plant. Tank ships unload LNG at the terminal at a maximum rate of 12,000m3/h. The liquefied gas is pumped from ships by three unloading arms to the three land-based tanks via a 42-inch pipe line. 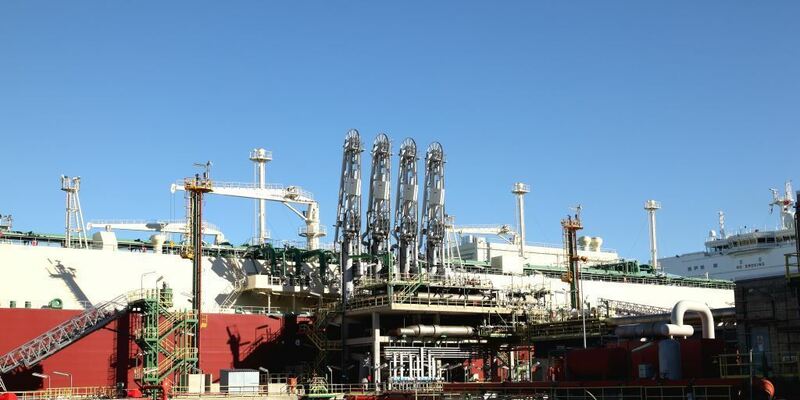 The BBG regasification plant features a ship back loading system that comprises valves, pipelines and all the required control devices. Currently, our facility features three above-ground cylindrical LNG storage tanks full-containment design, that can hold up to 150,000m3 each and each tank has four low-pressure cryogenic pumps inside. The design pressure of the tanks is 290mbarg and their heat loss is 0.05% per day from tanks fully filled with liquid methane. Both inlet and outlet pipe lines are connected to the top roof of the tanks, which feature safety alarm and cut-off systems. Tank temperature profile is measured by thermocouples on the walls and bottom of the tank. Furthermore, their level, temperature and density are automatically and continuously monitored. – LNG carrier: Pressure compensation during LNG unloading. – Reliquefaction unit: Condensation in cryogenic conditions. – Flare stack: Emergency or excess boil-off gas is sent to the flare stack. 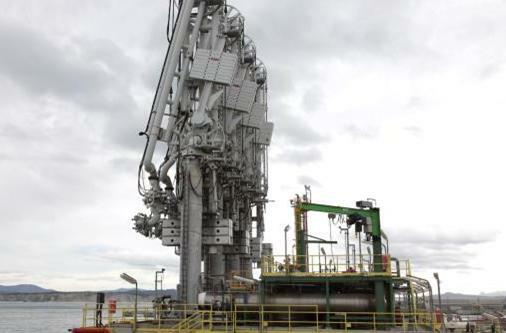 During normal operation, however, no gas is sent out to the flare stack. 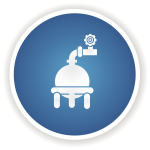 BBG has three four-stage, vertical boil-off gas compressors, each with a nominal capacity of 4500kg/h. 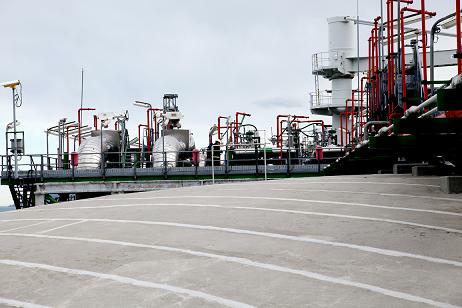 The LNG storage tanks are equipped with four primary pumps that send out the LNG to the recondenser, where compressed boil-off is recondensed as the gas mixes with the LNG, and is sent to the secondary pumps (there are nine of them at the plant), where pressure is increased up to 80barg. The regasification plant features four 200,000Nm3/h vaporisers using seawater that has been previously heated in the condensation unit from the combined cycle power station, compensating for the temperature increase and preventing the impact on the surrounding marine environment. LNG gasification is carried out in vaporisers working at around 75barg. The gas is sent out at just above 0ºC. There is an auxiliary submerged combustion vaporiser as well. 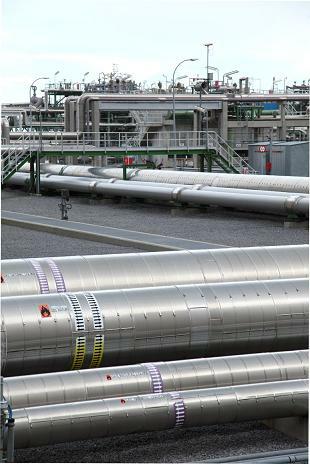 Natural gas from the vaporisers flows to two different metering stations: 1) the grid at 72barg via a metering station provided qith six lines featuring ultrasonic meters; and 2) the combined cycle power station through a line at 36barg via a control and measutring station. 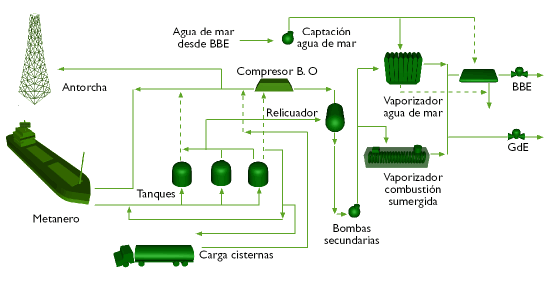 The seawater system comprises a pool, five seawater pumps and their associated pipelines. The seawater used in the vaporisers is driven by two pumps with a capacity of 33,000m3/h each. 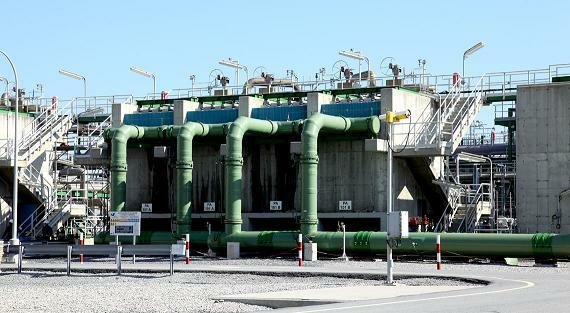 The pumps sit in an seawater intake basin to the east of the plant that sends the seawater to the BBE combined cycle power station, where it is used in condenser cooling unit. 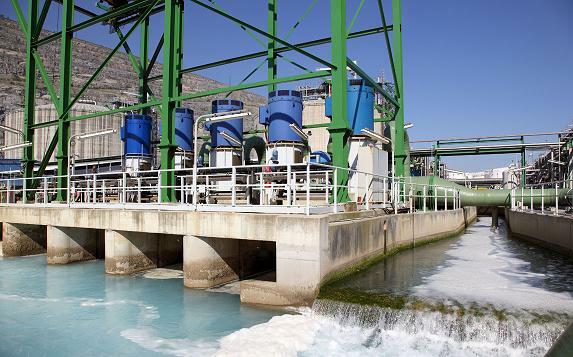 From the BBE combined cycle power station, the water flows into the pool, where levels are stable and speed decreases. Here, the seawater vertical pumps pump the water to the LNG vaporisers. The sea water, once it is been used on the vaporizers, and thetemperature reduced, it is sent back to the pool and from this point back to the sea.. This layout takes advantage of the higher temperature of the seawater coming from the combined cycle power station, which makes for highly energy efficient regasification performance and prevents unwanted impact on the surrounding marine environment. For more information, read our environmental policy. 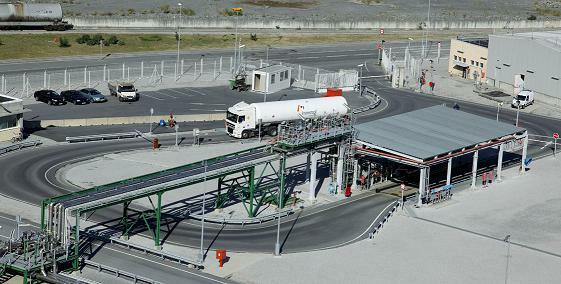 LNG tank trucks are loaded in a single loading station featuring loading arms, scale and control system. The LNG flows into the station pumped by the primary pumps located in the storage tanks. The LNG tank trucks carry the liquefied gas to the satellite plants. The loading unit can fill up to 15 trucks a day. The fire protection system is made of pumping equipment and a lattice tube system that surrounds the plant’s processing units. It includes foam extinguishers, water spray devices, etc. The plant’s main water supply is the sea, which means the priority water pumps of the fire protection system have been installed in a seawater intake basin. There are two types of pumps: electric-motor and diesel-powered. 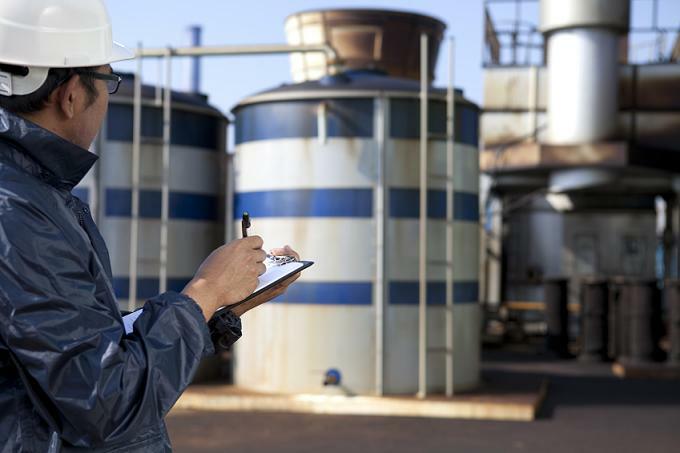 In addition, there is an emergency shutdown system (ESD) designed to stop the flow of fluid or gases through one, some or all the units in the regasification plant on the event of a detection of a dangerous event or in situations that so require. The plant has other components that are necessary for proper operation, like two 30kV power lines, self-consumption fuel gas, compressed air for plant and instruments, nitrogen plant, emergency generator, etc.